For Jewish rebels in ancient Judea, see Maccabees and Zealots. 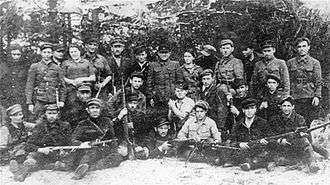 A number of Jewish partisan groups operated across Nazi-occupied Europe, some made up of a few escapees from the Jewish ghettos or concentration camps, while others, such as Bielski partisans, numbered in the hundreds and included women and children. They were most numerous in Eastern Europe, but groups also existed in occupied France and Belgium, where they worked with the local resistance. Many individual Jewish fighters took part in the other partisan movements in other occupied countries. In all, the Jewish partisans numbered between 20,000 and 30,000. The partisans engaged in guerrilla warfare and sabotage against the Nazi occupation, instigated teens and freed prisoners. In Lithuania alone, they killed approximately 3,000 German soldiers. They sometimes had contacts within the ghettos, camps, Judenrats, and with other resistance groups, with whom they shared military intelligence. In Eastern Europe, many Jews joined the ranks of the Soviet partisans: throughout the war, they faced antisemitism and discrimination from the Soviets and some Jewish partisans were killed, but over time, many of the Jewish partisan groups were absorbed into the command structure of the much larger Soviet partisan movement. 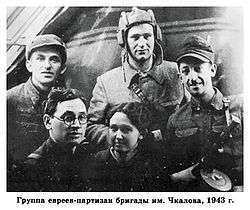 Soviet partisans arrived in western Ukraine in 1943, and consisted of Russians, Ukrainians, Poles, and Jews, and were smaller in size than that of units in Belarus, which was more suitable for partisan warfare. Released Soviet archive data suggest that Jews amounted for 5.2% of partisans in Ukraine. The Jewish partisans had to overcome great odds in acquiring weapons, food, shelter and evading capture. They typically lived in underground dugouts called zemlyankas (Russian: землянка) and camps in the forests. Nazi reprisals were brutal, as they employed collective punishment against their supporters and the ghettos from which partisans had escaped, and often used "anti-partisan actions" as a guise for the extermination of Jews. In some areas, partisans were supported by local villagers, but due to widespread antisemitism and fear of reprisal, the Jewish partisans were often on their own. The partisans operated under constant threat of starvation. In order to survive, Jews had to put aside traditional dietary restrictions. While friendly peasants provided food, in some cases food was stolen from shops, farms or raided from caches meant for German soldiers. As the war progressed, the Soviet government occasionally airdropped ammunition, counterfeit money and food supplies to partisan groups known to be friendly. Those who managed to flee the ghettos and camps had nothing more than the clothes on their backs, and their possessions often were reduced to rags through constant wear. Clothes and shoes were a scarce commodity. German uniforms were highly prized trophies: they were warm and served as disguises for future missions. Those who were wounded or maimed or fell ill often did not survive due to the lack of medical help or supplies. Most partisan groups had no physician and treated the wounded themselves, turning to village doctors only as a last resort. The forests also concealed family camps where Jewish escapees from camps or ghettos, many of whom were too young or too old to fight, hoped to wait out the war. While some partisan groups required combat readiness and weapons as a condition for joining, many noncombatants found shelter with Jewish fighting groups and their allies. These individuals and families contributed to the welfare of the group by working as craftsmen, cooks, seamstresses and field medics. Jewish partisan groups of note include the Bielski partisans who operated a large "family camp" in Belorussia (numbering over 1,200 by the summer of 1944), the Parczew partisans of southeast Poland, and the United Partisan Organization which attempted to start an uprising in the Vilnius Ghetto in Lithuania and later engaged in sabotage and guerrilla operations. Thirty-two Jews from the Mandate for Palestine were trained by the British and parachuted behind enemy lines to engage in resistance activities. In the Warsaw Ghetto Uprising, two groups of partisans, the right-wing Jewish Military Union (Żydowski Związek Wojskowy, ŻZW) and the left-wing Jewish Combat Organization (Żydowska Organizacja Bojowa, ŻOB) led the uprising separately. Zog Nit Keynmol - the "Partisan Hymn"
↑ "Armed Jewish Resistance: Partisans". Holocaust Encyclopedia. United States Holocaust Memorial Museum. Retrieved 2006-07-09. 1 2 3 4 5 6 7 8 "Living and Surviving as a Partisan". Jewish Virtual Library. Retrieved 2006-07-09. 1 2 3 4 "Jewish Partisans". 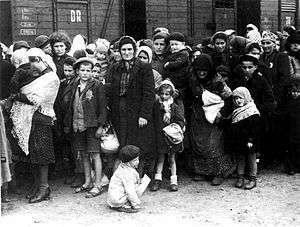 The Holocaust: A Learning Site for Students. United States Holocaust Memorial Museum. Archived from the original on 2006-06-15. Retrieved 2006-07-09. ↑ Marek Jan Chodakiewicz (2006-04-21). "Review of Sowjetische Partisanen in Weißrußland by Bogdan Musial". Sarmatian Review, Vol. XXVI, No. 2. Retrieved 2006-07-09. 1 2 The Holocaust Encyclopedia. p. 653. ↑ Rossolinski, Grzegorz. Stepan Bandera: The Life and Afterlife of a Ukrainian Nationalist. p. 282. ↑ Subtelny, Orest. Ukraine: A History. p. 475. ↑ "Photo Gallery: Partisan family camp in the Naliboki forests". Simon Wiesenthal Center Museum of Tolerance. 1997. Retrieved 2006-07-09. ↑ Jennifer Rosenberg. "Abba Kovner and Resistance in the Vilna Ghetto". About.com. Retrieved 2006-07-09. Yitzhak Arad. "Family Camps in the Forests", in Encyclopaedia of the Holocaust, vol. 2, pp. 467–469. Illustrations, map. Israel Gutman, Shalom Cholawski, Dov Levin, Shmuel Spector. "Partisans", in Encyclopaedia of the Holocaust, vol. 3, pp. 1108–1122. Illustrations, map. Resistance: Untold Stories of Jewish Partisans (2001). Documentary film directed by Seth Kramer. (IMDB record).